evaluated with green flu ores cence p rotein (GFP) expression assays. 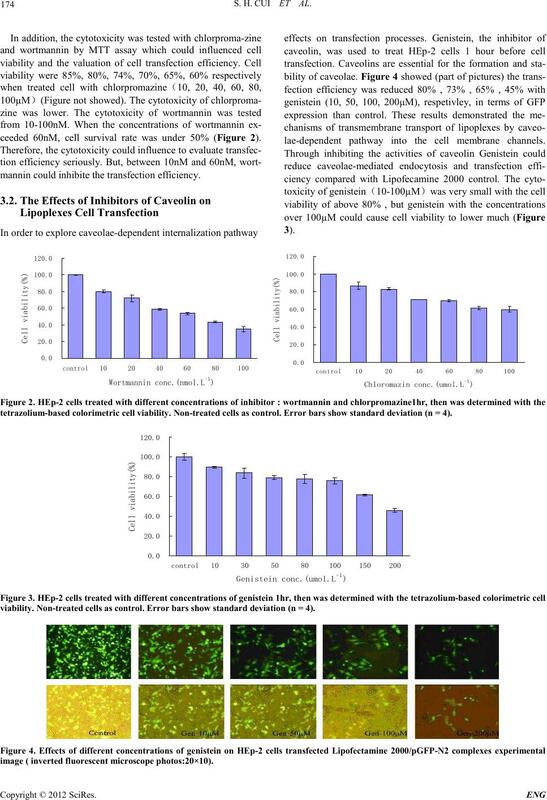 Cell viability and cytotoxicity were evaluated with MTT method. are non-immunogenic, easy to produce and not oncogenic. study could contribute to improving transfection efficiency. viral vector s, alth ough much effort has been exp ended on them. 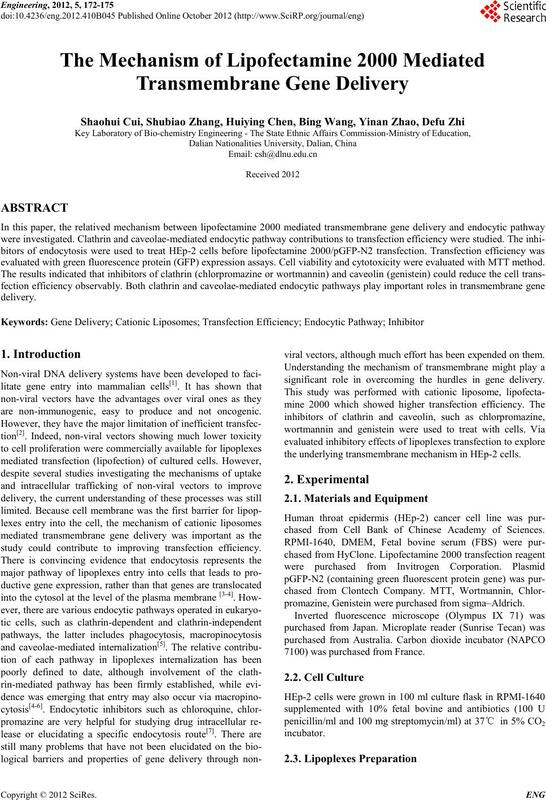 significant role in overcoming the hurdles in gene delivery. the underlying transmembrane mech anism in HEp-2 cells. chased from Cell Bank of Chinese Academy of Sciences. promazin e, Genistein were purchased from sig ma–Aldrich. 7100) was purchased from France. S. H. CUI ET AL. ratio of lipofectamine 2000 to pDNA was kept constant at 3:1.
well. It was mixed gently by rocking the plate back and forth. 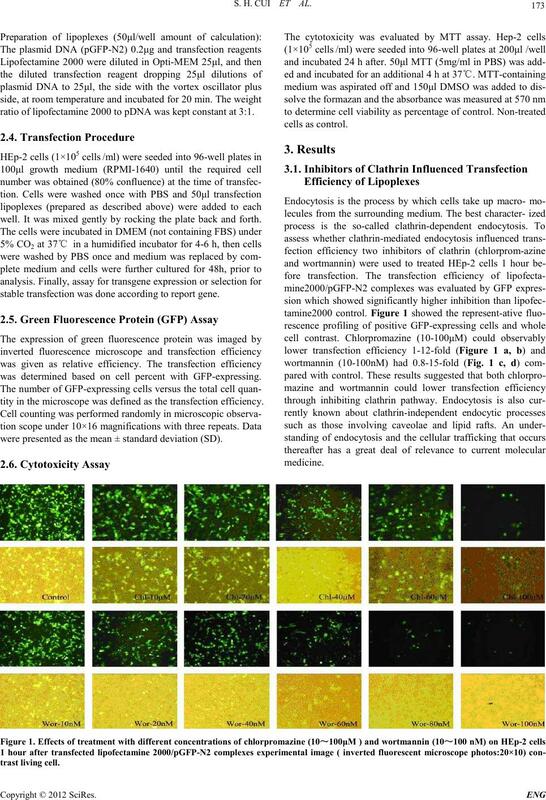 stable transfection was do ne according to report gene. was determined based on cell percent with GFP-express ing. tity in th e micros cop e was defin ed as th e tran sfectio n efficien cy. were presented as the mean ± sta ndard deviatio n ( SD). ceeded 60nM, cell survival rate was under 50% (Figur e 2). mannin could inhibite the transfection efficiency. lae-dependent pathway into the cell membrane channels. tetrazolium-based colorimetric cell viability. Non-treated cells as control. Error bars show standard deviation (n = 4). viability. Non-treated cells as control. Error bars show standard deviation (n = 4). image ( inverted fluorescent microscope photos:20×10). 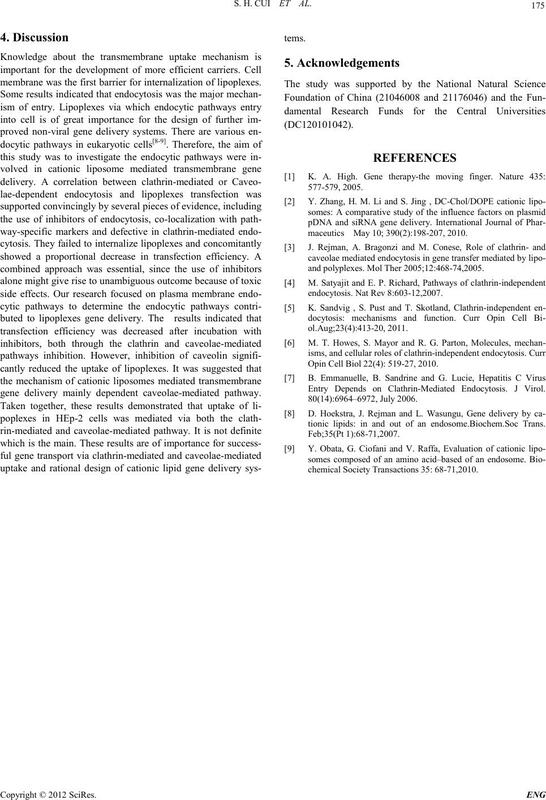 membrane was the first barrier for internalization of lipoplexes. gene delivery mainly dependent caveolae-mediated pathway. maceutics May 10; 390(2):198-207, 2010.
and polypl exes. M ol Th er 2005; 12:468-74,2005.
endoc ytos is. Nat Rev 8:603-12,2007. Opi n Cell Biol 22(4) : 519-27, 2010. Entry Depends on Clathrin-Mediated Endocytosis. J Virol. tionic lipids: in and out of an endosome.Biochem.Soc Trans. Feb ;3 5( P t 1) :68-71,2007.
chemical Society Transactions 35: 68-71,2010.